Should you work in the Newark schools if you think the children are potential criminals? 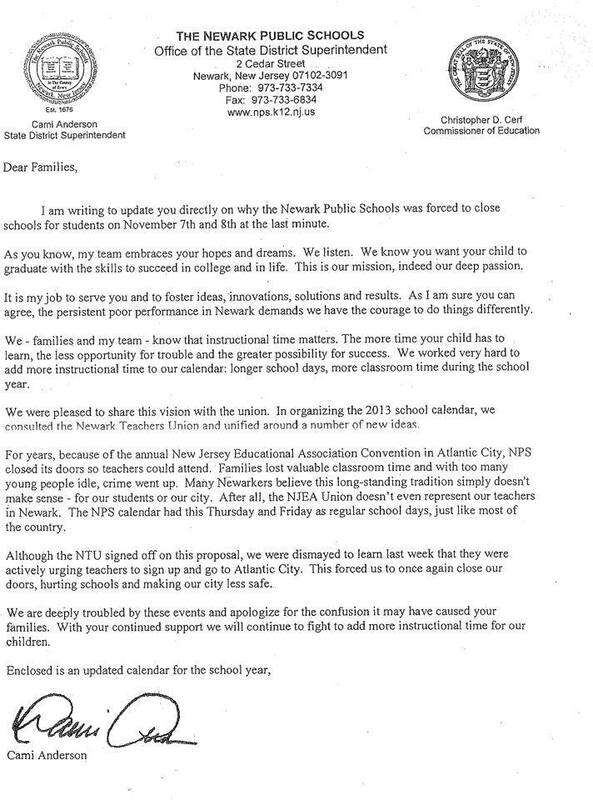 The central administration of the Newark Public Schools sent out a letter last week to “families”–a letter over the signature of state-appointed superintendent Cami Anderson –that displayed unforgivable insensitivity by suggesting crime would go up because Newark’s children were not confined to their schools for the two days of the New Jersey Education Association convention. It posted the same letter on its website. The e-mailed letter, sent to school principals Nov. 12 for distribution home through students, was withdrawn within two hours and then taken down from the website, according to multiple sources in the Newark schools. However, in at least one school–perhaps more–the original version was sent home to some 700 families. I originally posted the letter sent to me by a Newark teacher. I later took it down and deleted all references to it because of concerns I had about its authenticity. The letter contained grammatical mistakes. Its last sentence ended with a comma–as does the sanitized version. It was sloppily written., And, of course, it contained volatile language about the imagined criminal propensities of Newark children. Frankel, who holds the title of executive director of communication, said he wished to speak with me on the telephone. I said I preferred written answers to my written questions to avoid misunderstandings. I have written statements from school employees who saw the original letter and witnessed its distribution to students. I have hard copies of what was distributed. 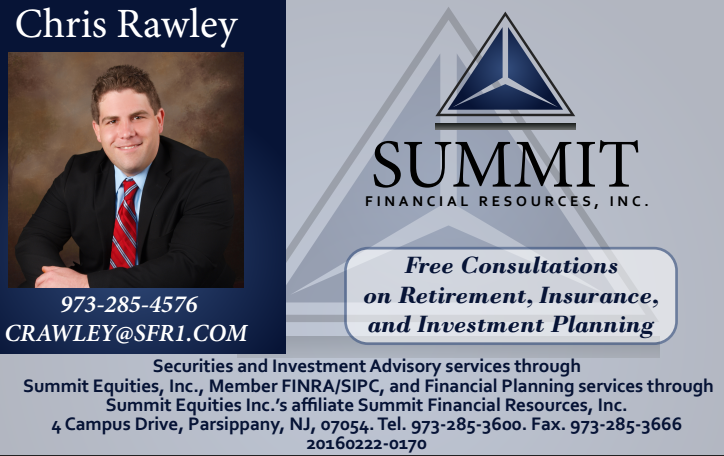 “Bob – This is the letter that went out and is posted on our web site. Thanks.” He attached the sanitized version that can be found on the website. Frankel’s note is not a lie, of course, but it hardly answers the questions I posed. The scrubbed version did, in fact, go out and is now posted on the website. I sent him a copy of the original letter and he would not comment on it. 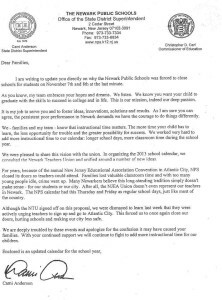 The letter was prompted by the controversy that erupted when, on Nov. 6, Anderson announced she would close schools to students Nov. 7 and 8, the date of the annual New Jersey Education Association (NJEA) convention, causing massive inconvenience to parents and school employees. She blamed the union for the disruption, contending it encouraged Newark teachers to attend the Atlantic City convention. The union, however, pointed out that teachers were permitted by law to attend the convention without penalty and warned the schools would not be properly staffed. After the students returned Nov. 12, the central office sent out the controversial letter. Whatever the differences over the NJEA convention, the children of Newark should not be considered nascent criminals. Anyone who believes they are has no business working in the public schools. I think Ms. Anderson should resign. The worst of the letter is her insinuation that, without the schools open, crime would increase. First, she writes, “The more time your child has to learn, the less opportunity for trouble and the greater possibility for success.” Why insert the “opportunity for trouble” in this note? Then she says, “Families lost valuable classroom time and with too many young people idle, crime went up” when teachers attended the NJEA convention. Anderson, who has been staunchly defended by Gov. Chris Christie and was recently awarded a $50,000 bonus, cites no evidence for this contention—and I have asked her for it. I also have asked the Newark Police Department to confirm her claims, and it hasn’t responded. Forget for a moment that national statistics do not support her contention that juvenile crimes increase when children are home from school. In fact, the opposite is true. Juvenile crime peaks on school days in the hours after children are released from school. It is less on non-school days. There is evidence, of course, that after school programs deter that problem—but Newark is located in Christieland where “you people” don’t deserve money for after-school programs. But the real question is this: How can someone who believes the children of Newark will go on a crime spree on non-school days serve as the superintendent of Newark’s public schools? Can anyone imagine the superintendent of the Westfield or Millburn or Mountain Lakes schools saying such a thing? Stereotyping is wrong. Racism is wrong. Entrusting children to a superintendent who can make these comments is just wrong. (A note about the ad: I only have one advertiser, The Garden, my local hangout where I spend at least one weekend night. If you click on the ad, then go to promotions, you can retrieve a 15 percent off coupon. Pretty good deal. Tell’em Bob sent you and maybe we can meet up). Playing devil’s advocate here, so bear with me: There’s a major grammatical error in the first sentence, and the closing is awkward and incomplete. Why would the superintendent of the state’s largest school district allow that letter to go out? If indeed it’s an authentic letter, it’s a very sad commentary on who’s minding the ship in Newark. Bob Braun: Marie, I agree with you and that was one of the reasons I hesitated posting the letter. I became convinced it was authentic when the NPS spokesman declined to comment on it. Also, I have spoken with Newark school employees who saw the original version. I do not doubt NPS people will deny its authenticity but it is too late. So the school to prison pipeline in Newark has now morphed into the school IS a prison? Without the guards the inmates go on a crime spree? This is absolutely disgusting. This woman should not be anywhere near children or schools. No one with such a biased view of the students under her authority should be allowed to be a school leader. Thanks, Bob, for bringing this to our attention. I first, thank you for the courage for speaking out against these powerful lunatics who are hellbent on destroying public education, public safety, and the public interest in this state. Because of that, you are in my family prayers. I am an educator, and possess 15 years serving as a teacher, a school psychologist, an administrator. And, I am one who can truly say if I had all the money in the world, I would still, teach, counsel, help the learning of kids. It is a professional calling. I am sick and tired of the Cami Andersons, Chris Cerfs, and fiascos that include charter schools, state take overs, teachnj, achievenj, NCLB and RTT. I am tired of it. Instead of actually making a positive difference and adding to pedagogy, only success it had include perpetuating failure of black, brown and poor people, and fostering of an atmosphere of fear and intimidation. However, there is another success. A whole lot of people are getting rich, and none include the teacher. Speaking truth to power always come at a risk and thank you for your courage and inspiration. Talking with my colleagues, we all ask for a defender on our behalf. We are waiting for our Hero. It is time to be that hero we’ve been waiting for. Thank you for being a hero. Bob Braun: Thanks for your very kind words. I am hardly a hero. Heroes are people like you and teachers in inner cities who help children every day of their professional lives. Well said to the both of you!!! I’m not surprised that the superintendent would send a letter like that. Her partner in crime Christie once said, on a local TV show, that he was so proud of his mother for having the good sense to ask his grandparents for money to help send him to a school in Livingston. If not he would not have had the opportunities he had, to become what he is today, if he was educated in Newark. So, he sat there on TV and told Newark children they have no hope of success because they only have a Newark education. Well I don’t think anyone told that to the “Three Doctors”, Sampson Davis, MD, George Jenkins, DMD, and Rameck Hunt, MD. or our city council members, laywers, myself and other professionals who were born, raised and educated in Newark. Bob Braun: Thanks for this note. I agree about how insulting it was for him to say he was proud of his family’s white flight. And how strange it was for him to gain the support of Cory Booker and Joe DiVincenzo despite such comments. The white political class has hated New Jersey’s cities for as long as I have been actively observing the scene. Wow, I am speechless. So now she has reduced teacher to prison guards and their students to criminals. Christie’s people will do anything to berate teachers and their union. I am a teacher and I didn’t attend the convention, but I DID spend 4 of the 5 days that I had “off” grading papers and planning instructional activities for my students because during the course of a regular day it is impossible to get those things done. If you are a good teacher, you are ALWAYS working. Always. Even when you are out and about you are looking for inspiration in what you are doing to bring to your classroom. Personally, I am sick and tired of being berated due to the general ignorance of people who are goaded by this type of propaganda. It makes me SICK. Bob Braun: Thanks for the note and your good work. I would also like to add that students DO NOT lose any instructional time. Schools are in session for students for 180 days no matter what, not 178 because there is a teachers convention. So Anderson’s comments make no sense at all. If schools remained in session for those two days, they would only get out of school two days earlier. Considering these things, this was only an attempt at creating unwarranted strife between parents and teachers. Bob Braun: Again, I agree. Soooooooooo, if the INSTRUCTIONAL DAYS were an issue, we are now +4 over the state requirement opposed to -2 under it… Just thinking OUR LOUD!!! Bob Braun: I don’t disagree with you but I believe the central issue of Anderson’s letter is not days off but about Anderson’s attitudes toward the children of Newark. I am surprised and disappointed at the lack of reaction from the NTU and from the usual loud voices among Newark politicians. I echo that concern and sentiment… That is something I intend on looking into on both ends. Bob Braun: Go for it. I see all this FB traffic about Arne Duncan’s comments about “white, suburban moms.” That’s nothing compared to this. November 17, 2013 - 1:05 PM Pingback: Reflections on Teaching » Blog Archive » But, I’m not a racist! I attend one of Newark Public School’s and i did receive this letter from my teacher. It was passed out to the entire school. I was insulted and angered she basically implied crime went up because i had no school for 2 days. I spent those 2 days relaxing at home watching some movies. I have no clue what kind of garbage she is talking about. Cami is not in touch with reality shes a complete jerk and gets paid to be one. Bob Braun: Can you tell me the name of your school? My daughter attends Lafayette Street School and I received the letter. Bob Braun: Thanks for this. How did you react to what Ms. Anderson wrote. I am the daughter of a long time NPS teacher and the significant other of an NPS teacher. I have been around NPS my entire life. I expect nothing less of an administration who expects to quantify the learning process for funding, which the children are not and will never be recipients of. Instead, Cami Anderson gets a 50k bonus while teachers who work around the clock essentially received a pay cut because they are now responsible for their benefits. The Christie and Anderson administrations do not want teaching to continue to be a career and profession, they want it to be a factory job cranking out children to blame the failure of the public system on teachers and praise the success of charter schools. The students may have had off on that Thursday and Friday, but do not make the mistake of thinking the teachers of NPS were also given a fall break. Any teacher that didn’t go to the convention had to report for professional development. The reason why this wouldn’t be acceptable in districts like Westfield and Summit, they wouldn’t be able to get away with it. School used to be a safe haven for Newark children who didn’t have support at home to have a fighting chance in the world. Instead, it has become a game of survival of the fittest to blame teachers and redirect funds at the expense of thousands of futures. I am as well insulted. I am a teacher at the NPS and my children attend NPS. In no way, shape, or form are my children criminals. My children are honor roll and super honor roll students. All three of them are doing very well. One is in high school, the other in middle school , and my youngest in elementary school. How dare she assuem that all parents in Newark are irresponsible! Many of my students have great parents. Parents that care about their future and that are behind me 100%. She needs to go! Anyone that assumes that their students are failures is not a good educator. We teach our children to strive to be the best that they can be. Not to assume that if their isnt school, they will fail and cause problems. SHAME ON HER! The scary thing is that she felt her words were acceptable. Can you imagine what she (and others in her camp) must really think of the children and families that she is being well paid to serve? It is all very sad! No one that works at NPS was surprised! They already’ ready knew when Cami eliminated minorities from central office and replaced them with younger mostly caucasian friends and family. Over 100 consultants paid high six figure salaries(some consulting companies received millions)…again mostly caucasian. bonuses and well deserved increases. She refuses to offer the nurses a new contract…no increase in five years,disgusting. Board employees are not allowed to talk to the press, so Cami gets last word always. We are not all afraid. Some of us are just shocked. Do not take the silence for ignorance however. Some of us parents/employees wanted that Hero – any Hero to come in and cure this failing education system. We aren’t racist, thus color didn’t matter. She has drawn an ugly line in this sand. Bob Braun: Well said. Don’t wait for Superman. He isn’t coming to Newark. Superman is us. I am absolutely convinced that Christie and Anderson hate Newark public school children. On December 16 the Assistant Superintendent came to my children’s school (Newton Street, Newark NJ) to let us know that the school was closing at the end of the year. There was no warning or discussion, the decision had already been made without any input from the parents and he was basically telling us “take it or leave it”. Now we’re forced to either send our children to charter schools or NPS schools that are not in our immediate area. They’re shoving crap down our throats and calling it caviar.Then they tell us that we can use one application for eight different schools online but the website is down. Oh and I forgot to mention that this will be my children’s THIRD SCHOOL IN FOUR YEARS. This whole thing is making me want to move out of the state just to make sure my kids can go to school uninterrupted. Sheesh. Newark Public School Advisory Board Business Meeting Tuesday, January 21, 2014 at 5:30 p.m. 2 Cedar Street, Newark NJ 10th Floor Large Conference Room . Curious if the statement on crime is based on anything outside of a belief? We may want to look into the stats to see if crime goes up when school is out. Many organizations were developed to keeps kids off the street and out of trouble. These organizations educated our youth, provide mentor ship, and promote love in our community. Midnight basketball leagues. community rec centers, afters programs etc all aim to keep kids out of trouble, in addition to the items mentioned earlier, by providing them an alternative. Why is it so wrong for a school to feel the same? I believe anything this women says or comes from NPS will be criticized. Similar to when in a bad intimate relationship that the littlest item will bother you. I just hope we as a community use evidence to support our opposition. Dot all i’s and cross our t’s. Bob Braun: Stats are recited in article. Days off do not mean more crime. Lack of after-school programs do.